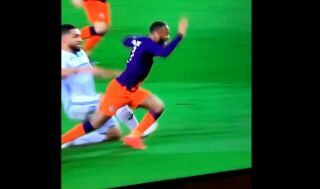 Manchester City star Raheem Sterling produced a truly shocking dive against Swansea City in yesterday’s FA Cup win. The England international undoubtedly gets a lot of stick – most of it unfair – but this was not one of his finest moments. Watch the video clips above and decide for yourself, but this seems a very blatant attempt to con the referee with some disgraceful play-acting. Sterling is a world class performer who’s taken his game to another level under Pep Guardiola at City, and shouldn’t need to be resorting to simulation like this. Let’s hope the embarrassment of this video doing the rounds can persuade the former Liverpool man to stamp this out of his game.